"The exotic Plumeria with its velvety texture and sweet fragrance has been cherished in the islands as a lei flower for years. The experience of wearing this fragrance is like that of wearing the lei. You will immediately be enveloped in the soft, warm and sensual fragrance of the Plumeria flower. Take the scents and the memories of the islands home with you!" Beautiful glossy box picturing plumeria flower. Note: Also available in Gardenia and other scents (select below). Gift wrapped. Comes with Hawai'i post card. Please enter a gift message in the Comments field during checkout. 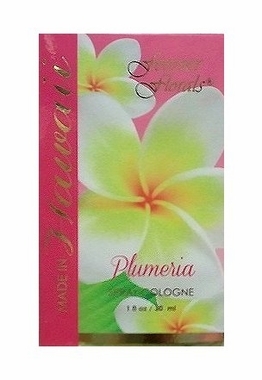 Find a matching Plumeria body lotion or complimenting Plumeria Perfume Essence. Order Processing Time: Ships in two-four weeks (March update).